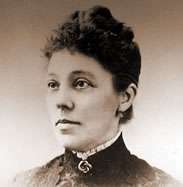 When Emma Nutt reported for work at the Edwin Holmes Telephone Dispatch Company in Boston on Sept. 1, 1878, she became the world's first woman telephone operator. Hours later, her sister Stella became the world's second female telephone operator. Alexander Graham Bell, the inventor of the first practical telephone, hired Emma away from a telegraph office. She was paid $10 per month for a 54-hour workweek, though she did get an hour for lunch. She supposedly remembered every number in the New England Telephone Company directory. Teenage boys worked as telephone operators – after all, they’d worked as telegraph operators from the beginning. But they didn't do well actually talking to real people. They were impatient, they liked to play jokes and they swore. Emma Nutt, on the other hand, had patience and a cultured, soothing voice. Her success led women to rapidly replace boys as operators. By the end of the 1880s, nearly all telephone operators were women. To get a job as an operator, women had to be unmarried and between 17 and 26. They had to be tall enough to reach to top of the telephone switchboard. African American and Jewish women couldn't get jobs as operators. Emma loved her job and stayed at it for at least 33 (possibly 37) years. Her sister left after a few years to get married. By the time Emma retired, the Edwin Holmes Telephone Dispatch Company consolidated with other small exchanges into the New England Telephone & Telegraph Company. Its service connected the nation. 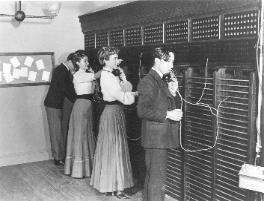 By the early 1900s, the phone companies ramped up the pressure on the operators. They forced the women to work two shifts in one day separated by an unpaid, three-hour break. The operators worked under strict discipline at an intense pace while sitting in straight-backed chairs. Supervisors watched them closely, punishing minor mistakes with detention. When World War I broke out, the telephone operators took advantage of the resulting labor shortage. They went on strike for higher wages and better hours -- and they won. After the war, employers tried to take back those gains. At 7 a.m. on April 15, 1919, New England’s night shift operators walked off the job. That began a five-state telephone operator strike in New England involving thousands of women with strong community support. Five days later, management acquiesced, granting wage increases and union recognition.